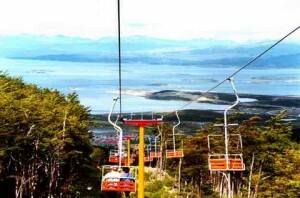 Ski slope behind Ushuaia with a view of the Beagle channel The island opposite is the Isla Navarino which belongs to Chile. Ushuaia, the most southern city in the world, has a very changeable climate. Two weeks ago it had snowed heavily. When I arrived, it was raining heavily. I went to a cheap hotel suggested by the Tourist Office, but as soon as I took out my British passport, the owner said. “You can only stay one night. Tomorrow I am expecting a big party“. I gritted my teeth and asked if there is another hotel in the vicinity. He described the way about 15 mins walk. When I arrived carrying my luggage in the rain I could not see anything. I asked a passer-by who informed me that the hotel had shut down 6 months ago. There is no overt hostility against the Brits, but a certain coldness, especially down in Patagonia. In every town there is a monument to the Heroes of the Malvinas. Needless to say that I was Greek throughout the rest of the trip. I finally splashed out and lodged in a big central hotel and that was that problem solved. Incredibly, the weather turned again and became sunny and mild. Next morning I went to the most southern ski place in the world, just behind Ushuaia. In the summer there is a chairlift and I hiked for one hour up the mountain to the base of the glacier. The lichen and bog vegetation was unique; If you strayed from the path, the green pastures could be hiding deep muddy bogs that can swallow you like green quicksand. From the top, there were fine views of the Beagle channel, between Tierra del Fuego and the Isla Navarino, the last piece of land before Antarctica. A young Darwin traversed it on the eponymous ship back in the 1830s. Is there another ski place where you can ski and see the ocean? 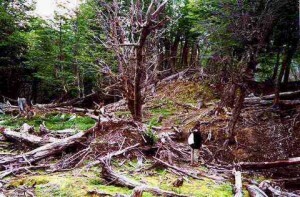 Deforestation caused by beavers near Ushuaia. The woman is standing on one of the enormous dams. My second trip was to the Tierra del Fuego National Park. After Torres del Paine I thought I had seen everything, but this Park was exceptional in that it was full of beavers. I hiked for four hours on the sendero de los castores (trail of the beavers) which runs into Chile all the way to Lapataia. observing bird life (woodpeckers, eagles, ibises, kingfishers and quaquen geese) and looking amazed at the huge structures that are the beaver dams. They introduced the beavers in the 1940s and the animals have now become pests, as they clear out the forest and pollute (and dam) the rivers which feed Ushuaia. It is because of them that tap water in Ushuaia is not potable. Potable or not, it has not stopped 10,000 people a year emigrating to the city. Ushuaia still had the pioneer air even in the closing years of the 20th century. Huts are being erected randomly, people were riding on horseback through the town, you could buy guns in shops. Was this the Wild South ? The city also has a remarkable museum, the aptly Museo al Fin del Mundo with fascinating Indian and early settlers’ relics. They stamp your passport with an exclusive stamp that says you’ve been within 800 miles of Antarctica. Except that the latitude of Ushuaia is only the same as say, Manchester’s. Just goes to show what the Gulf stream does for Scotland. Sea leopards and sea lions at the front, penguins on the right and cormorants on the left. And bloody feezing, too! My final trip was a cruise down the Beagle channel on a catamaran. 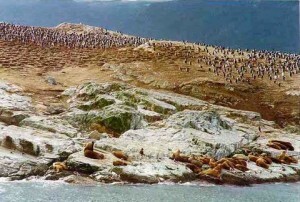 After observing sea lion, cormorant and Magellan penguin colonies we reached Islas Picton and Lennox (two of the disputed islands between Chile and Argentina) and took a turn to visit Estancia Harberton at the end of the Beagle channel. It belongs to an Englishman from Bristol. His great grandfather was a missionary who converted the Indians and produced a dictionary of the Yahgen language. He had 5,000 sheep brought from the Falklands to start his farm. Anyway, the weather changed rapidly again and we could not sail back. We radioed for buses, but they did not arrive until 5 hours later. Apparently the wind had blown a tree on the road and they had to return to Ushuaia to get a electric saw and cut their way through.